Shape is a very complex notion that combines some aspects of other obscure notions like speed, safety, connection and efficiency of stones. My knowledge of shape is very limited. There are two proverbs: "The empty triangle is bad" and "The sake bottle shape is negative". There are also exceptions to these proverbs and more or less one learns to see them. What I miss (and I believe many other people miss it too) is the skill to force the opponent into bad shape, while keeping one's own shapes good. Good players know much more about shape than those two proverbs. It is rare that bits of that knowledge come to weaker players. What is the correct answer to White 1? Stronger players know the answer, weaker players may consider it as a shape problem. I give the solution on a separate page. I learned the correct answer from a professional's commentary on a 6k game. In fact I was amazed by the move that the pro recommended (the 6k amateur made a mistake, of course). After that I began to pay attention and soon some information came from the 5d* games I observed on IGS. 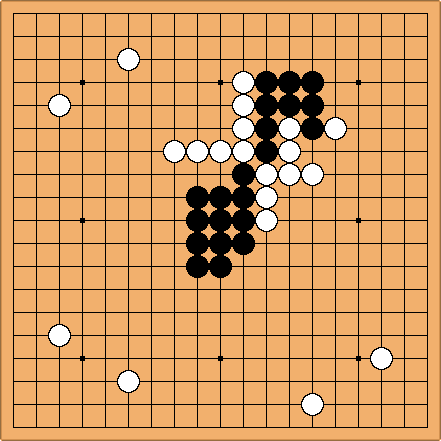 In similar positions IGS 5d* players make the move that was recommended by the pro. I started to use it in my games. Of course, the opportunity comes not that often but I used it 5 or 6 times. Each time it turned out to be a success. Not immediately but eventually it gave results. It is sad that this kind of knowledge does not come by itself. It is very difficult to invent that move. You have to read about it. 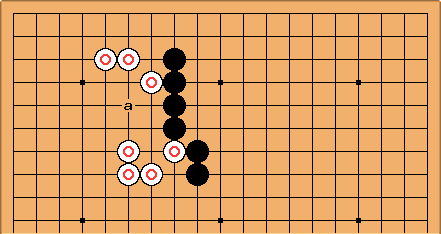 This move is not something that you may read out while playing. You have to be experienced and actually you have to know. Recently I observed a game on IGS between 4d* player and 4d player (that was actually the first game of the 4d guy, perhaps he did not know what strength you have to be to claim the 4d rank on IGS). The 4d guy lost it big, 30+ points. And a position similar to the diagram appeared. He answered wrongly. That left a very bad taste indeed. Come on! Even I know how to respond. Just a level indicator. I think that pros know a lot of small secrets like that. And that knowledge is very difficult to collect. But each of them gives an extra point or two and eventually good shapes find their kill. OK, I have my own complaint about shape (maybe because I've been losing a lot of games lately?). "Light" play is good, and "heavy" is bad; yet "thick" is good, and "thin" is bad. So we want to make light, thick plays? And avoid thin, heavy stones? Is this not a Thin vs light? I think the diagram above is more a question about suji than about shape. If just for once I can cite my own book, p.179 of Teach Yourself Go is a problem set on this type of point. Jasonred Feel free to edit or comment. Methinks this is an example of what not to do in any circumstances, an extreme example of course. 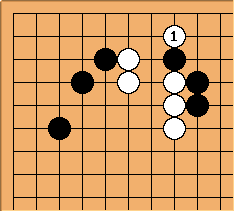 I think Black here is somehow thin, yet heavy... of course, you have to be pretty bad to be filling in your own eyes. I think that thin/thickness and heavy/light are not necessarily the same thing. I would say, light/heavy play is the difference between "wasting moves" by playing in inefficient spots in a local area, instead of playing the bigger points. Thin/thickness has to do with defence, or how secure your position is, which usually corresponds with how many stones there are locally defending, but at different strength levels, it can depend more on, and here we have it, (da da da DAAAA!!!)... Shape! Charles Matthews What that diagram illustrates is firstly Overconcentrated shape. Groups can be heavy without being over-concentrated (see discussion at heavy versus overconcentrated). Thin implies tactical weakness - insufficient defensive strength. Charles Well, heavy isn't the same as inefficient or over-concentrated. It means more like 'burdensome'. And I don't think Black is thin there. You probably can have thin+over-concentrated in a shape - it would be ugly in a primal way. For example White's group here: in a minute Black can play at a to cut. Since 'heavy' is a strategic concept, it is a bit harder to illustrate heavy+thin though that can happen too. One point would be that 'thin' implies you are about to be cut. A plan of allowing the cut, sacrificing half the group with gain of some time and forcing plays, and running with better shape with the other half, is often an antidote to the heavy feeling.